Monday night's dinner was exactly what I was looking for. I hadn't made anything spicy in quite awhile after Josh's bout with acid reflux, so it was about time I made something full and flavorful. I'd been craving something like this for sometime now, but I didn't really know if this recipe was going to hit the spot. But it did, and it's going to hit that spot again at lunchtime when I ravenously devour my leftovers. 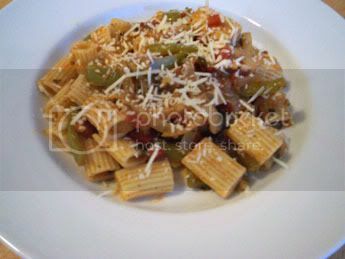 This recipe is from Giada De Laurentiis, but I found it via Dine and Dish. I don't watch much Food Network, which I'm sure sounds just absurd for a food blogger to write. I usually just can't stand many of the personalities that are on there- specifically Rachael Ray and Sandra Lee, but lots of people tend to bug me. I usually stick to PBS for my food television. Anyway, since I almost never tune into FN this is the first Giada recipe I've made. It is really good though, so I may check out one of her books soon. My notes: I made several adjustments to the recipe. Usually I follow most things pretty faithfully, especially when it's something I've never attempted before. But because I had a deep yearning to have this recipe come out a specific way I meddled a bit. First, I couldn't get turkey sausage, so I used pork. I mean, I looked, but even the gigantic meat counter at Central Market didn't have any. I used petite diced tomatoes because the hubster isn't partial to giant hunks of tomatoes, and because I wanted the tomato part to be a little more sauce-like. I used green bell peppers because 1) they're cheaper, and 2) offer more color contrast with the tomatoes. I ditched the Marsala wine and substituted half a can of water instead. I'm sure it adds a great flavor, but it wasn't the flavor I was looking for. And I definitely used the optional red pepper flakes. I love Giada's recipes. This is one that I haven't tried, and it sounds good. I will definitely give it a try!